Peter Chlebowski is eager for pollinators to find a home at UVM. The Pennsylvania native, who grew up on a small, seven-acre homestead where his family raises poultry and pigs while growing fruits and vegetables, helped launch the UVM Beekeepers club in April 2016. The club currently has five honeybee colonies set up in UVM’s Horticulture Farm in South Burlington and plans to transfer the hives to UVM’s Athletic Campus by the end of the academic year. Peter, president of UVM Beekeepers, has plans beyond setting up a permanent home for bees on campus. He and the club helped make UVM a certified “Bee Campus” this winter. Bee Campus USA offers a certification program to eligible campuses to create a habitat for and promote the health of pollinators. UVM is one of 18 Bee Campuses and the only one in New England. We talked to Peter, an Ecological Agriculture major, about beekeeping in Vermont, plans for farmsteading in the future, and the joy of fungi. 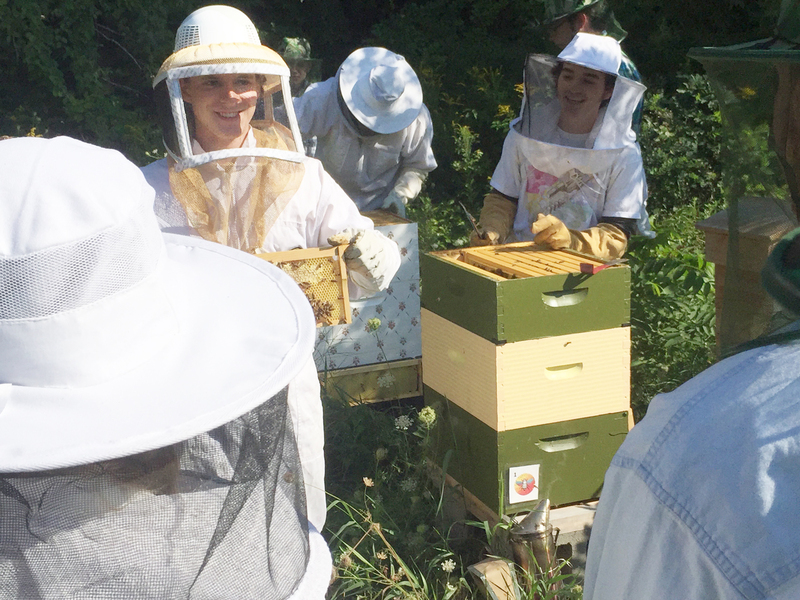 The UVM Beekeepers is an on-campus club dedicated to promoting pollinator health. Why did you decide to help establish UVM Beekeepers? I was a student at Ithaca College studying environmental science when I decided to transfer to UVM my sophomore year. When I arrived at UVM, I soon realized there wasn’t any kind of beekeeping club here. I had been keeping bees personally for four years and thought more people should know about them, considering that about one out of every three bites you eat is made possible by pollinators. You were at Ithaca before coming to UVM. What made you decide to transfer to UVM? The mountains drew me here, as well as the ecological nature of Vermont. I wanted to study something that could be hands-on and make a difference in food systems and climate change. What do you enjoy most about beekeeping? Bees are very interesting animals with their own society in their hives. Their social structure is highly efficient, and a single bee cannot survive on its own. I enjoy watching the colony grow and develop over time, as well as harvest some honey now and then. How do you care for bees in the winter? It’s more about what you do before the winter that really matters. It’s recommended that you provide 60 pounds of honey per hive in Vermont during the winter. We insulated the hives and made sure they didn’t have any mice. We’ll wait before we go into the hives this spring until there is nectar flowing so the bees have the ability to rebuild whatever has been disrupted. If we go in too early, it stresses them out. Your other interests include horticulture, foraging, as well as mushroom cultivation and identification. You would ultimately like to have your own permaculture farm/homestead. Why are you passionate about self-sufficiency and sustainability? I love food, and I really love locally produced food. I want to be self-sufficient rather than depend on companies and grocery stores. People tend to be disconnected from their food, which is unfortunate. By having a connection to your food, you can better understand your role in the ecosystem. Tell us about your interest in foraging and fungi. I have been foraging for a considerable amount of time starting when I spent time in the woods as a kid. Back home, a close friend of mine is an expert in mushroom identification, and I eventually got into cultivation. This past year I really started to dive into it more. In the fall, I attended the Radical Mycology Convergence, which included five days of workshops, presentations, and mycoremediation installations. One of the interesting things about cultivating mushrooms is that you can grow mushrooms on hay, coffee grounds, and agriculture waste, and that mushrooms can be included in a permaculture set up. In Vermont, I was surprised at the variety of fungi here. The cool thing about this kingdom of life is that they live in a very decentralized system and are found all over the world. I‘m considering graduate school and want to have my own homestead down the road. We have a plot of family land in Maine, so I’m planning to put some elements of permaculture there, such as beehives, mushroom logs, trees, and an orchard. I’m also very interested in working overseas or in other countries to look into foreign agricultural systems and see how I can help. Learn more about the UVM Beekeepers. Visit learn.uvm.edu to learn about food system and sustainability programs at UVM. I used to be suggested this web site through my cousin. I am not sure whether this post is written by him as nobody else recognize such specified approximately my difficulty. You’re amazing! Thanks! Its not my first time to pay a quick visit this web page, i am browsing this web page dailly and get nice data from here all the time. I read your post and it’s very interesting as well as very useful for me. There is certainly a lot to find out about this subject. I really like all the points you’ve made. Its like you read my mind! You seem to know a lot about this, like you wrote the book in it or something. I think that you can do with a few pics to drive the message home a little bit, but instead of that, this is wonderful blog. An excellent read. Hi there to every one, it’s really a good for me to pay a visit this site, it includes precious Information. I really think that this guy has done a great job. Yo bro!! you can do it. Awesome initiative bro. Wonderful story, reckoned we could combine a few unrelated data, nonetheless genuinely really worth taking a appear, whoa did one particular master about Mid East has got a lot more problerms at the same time. Always a big fan of linking to bloggers that I adore but do not get a lot of link appreciate from. In India, there is very unique way of beekeeping.. Here are some hyperlinks to web-sites that we link to for the reason that we assume they are really worth visiting. Very couple of internet sites that transpire to be comprehensive below, from our point of view are undoubtedly nicely really worth checking out. Although sites we backlink to beneath are considerably not related to ours, we feel they may be truly worth a go by means of, so have a look. We came across a cool web-site that you just may possibly get pleasure from. Take a appear when you want. Here is a great Blog You may Discover Intriguing that we encourage you to visit.